I mentioned last week that I was going to be dipping into the archives every-so-often and bringing back favourite recipes that have somehow fallen from my mind. 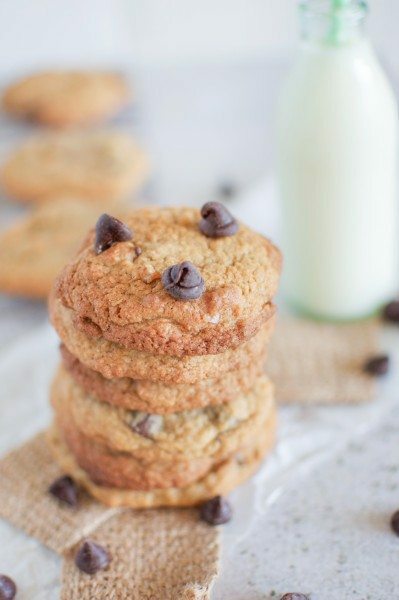 Chewy chocolate chip cookies are one of those recipes. When I came across this recipe over at Barbara Bakes I just had to try it. The recipe promises rich, chewy and thick cookies and what’s not to love about that. Barbara starts her post about the biccies with an interesting discussion. 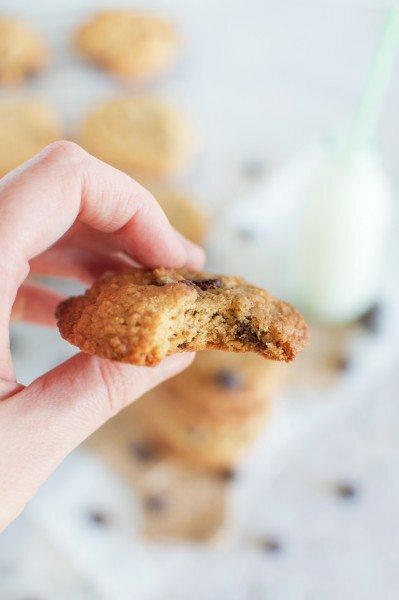 Most people have a very definite preference when it comes to chocolate chip biscuits. People seem to either like them chewy and thick or thin and crunchy. I have to say that I think both are delightful and I’d happily devour either biscuit as long as it tastes great. These cookies are so delicious I baked two batches in two days. No I didn’t eat them all I gave quite a few away as a gift. 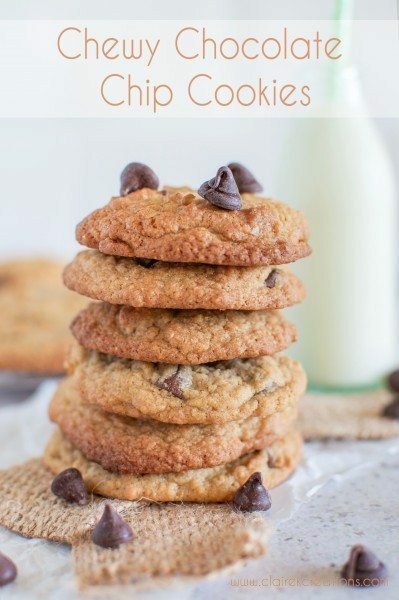 They’re very easy to make (no dough rolling or shaping) and only take 6 – 8 minutes to cook so you can be eating freshly baked cookies within about 15 minutes of finishing reading this post. One thing to note with these cookies is that they won’t look completely cooked when they first come out of the oven and will be quite soft in the middle. As long as the outside is golden they’re done. Don’t be tempted to leave them in ‘just a bit longer,’ I promise they’ll firm up as they cool. Another tip – if you want them to be extra thick, chill the dough for 30 minutes before spooning it out onto the trays to bake.Enjoy! 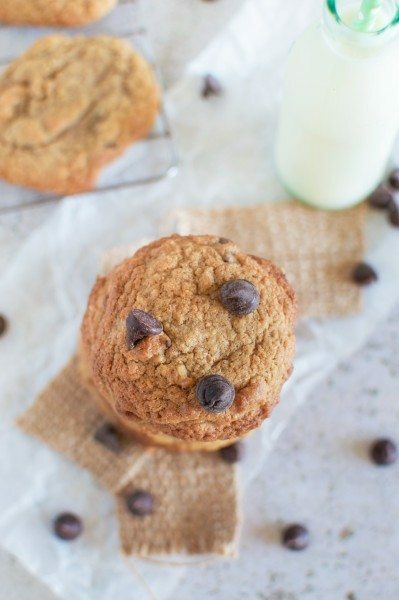 What about you, do you have a preferred type of chocolate chip cookie? Preheat the oven to 185C(365F) fan-forced. In the bowl of an electric mixer, use the paddle attachment to beat the butter and sugar together until smooth and creamy. Remove the bowl from the stand and stir in the eggs and vanilla. Add the flour, baking soda, salt and cinnamon and stir until just combined. Tip in the chocolate chips and stir them through. Spoon heaped-teaspoon-sized blobs onto a lined baking tray leaving about 4cm between blobs. Bake the cookies for 6-8 minutes and swap the trays half-way through if you are using more than one tray at a time. Let them cool on the trays until they are firm enough to move then transfer to a wire rack to cool completely. Biscuit sounds like a treat while cookies are everywhere. I like this recipe and chewy biscuits. Thank you for the recipe, Claire. I’m not so keen on chocolate these days (weird, I know) but I reckon these will be really popular for morning tea at Church! You could use nuts instead of the chocolate Diane. But yes a good crowd pleaser I’d say. I like my chocolate chip cookies chewy. I’ve never been a dry, crumbly cookie eater. Great recipe, Claire. There can be a very short time between crunchy and burnt right?